The tape begins with a quick intro by Alan Black. A wonderfully flawless version of Communication Breakdown, including It's Your Thing, is followed by an equally fantastic I Can't Quit You Baby. Page's sticky fingers tear the notes out of the strings. There is a brief interview with Page and Plant before Dazed and Confused. There is a bizarre post-apocalyptic comedy sketch interlude before a dynamic White Summer/Black Mountain Side. You Shook Me features Jones on organ. Bonzo's drums sound like a pounding heartbeat. Plant's extended harmonica solo has the whole band in top form. How Many More Times features a mellow jazzy groove during the guitar solo and the "squeeze my lemon..." interlude during the "got you in the sights..." section. A flawless radio performance by Led Zeppelin, definitely a must hear. The tape is an excellent broadcast master. If you must hear one version of this show make it Antarabata's Roch Hour. I normally don't like to plug a bootleg over an official product, but who here HASN'T bought BBC Sessions? I have, and boy was I disappointed. The broadcast slices and dices "Its Your Thing" from "Communication Breakdown", the comedy skit is gone, the interviews are absent, and "How Many More Times" is edited as well. This is the one time where the bootleggers got it right and the official release got it wrong. 'Rock Hour' is good, but I've found EVSD's 'The Complete BBC Radio Sessions' to have superior sound quality, and is just as complete. This source is the complete show, including introductions, interview, and a "Liverpool Scene" comedy(?) sketch. The show is designed to allow bands that would not normally be able to play full songs on other shows to do just that, and some really good performances here. Communication Breakdown and I Can't Quit You Baby start off the show. There is a brief interview with Page and Plant, and then they go into a strong Dazed and Confused. Then there is a brief sketch, then they come back with Page doing White Summer. They then do You Shook Me, and end with How Many More Times. 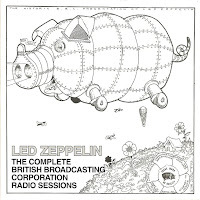 Sound is fantastic, several of these found their way onto the official Zeppelin BBC release. After yesterday's painful concert to listen to, today was pure joy.